Kyocera Corporation (President: Hideo Tanimoto) today announced its 6815 Series connector. 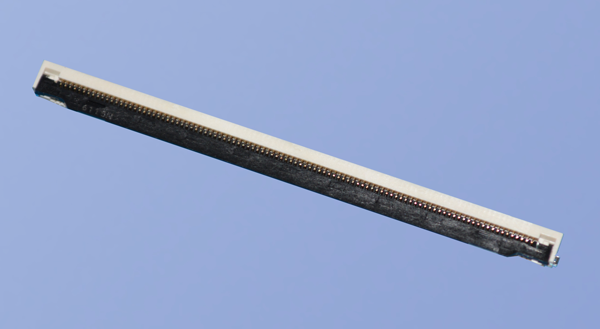 It is a 0.5mm-pitch flexible printed circuit (FPC) and flat flexible cable (FFC) connector with the world's highest pin count (up to 100 pins)*1. The new 6815 Series, now available globally, is optimized for the high-speed transmission requirements of high-definition 4K and 8K displays in applications such as TVs, medical displays and automotive infotainment systems. In addition to the growing market for 4K and 8K televisions, medical companies are introducing 4K and 8K displays into their equipment because high-definition images can better aid medical personnel when using surgery, early disease detection, or remote diagnosis equipment. The new 6815 Series optimizes high-speed data transmission for high-definition images. The higher pin count can reduce the total number of connectors required, allowing for space saving, simplification of the circuit design and reducing the labor requirement for connector insertion and mounting. The new connectors were designed to work with the V-by-One®HS*2 transmission interface, which reaches speeds up to 3.75Gbps. Kyocera also offers a high-and-low temperature resistant type (-40℃ to 105℃(257°F)) ideal for automotive infotainment, such as navigation systems. The connectors feature up to 100 pins and are compatible with V-by-One HS, the next-generation interface standard for LCD television displays. The standard type offers an operating temperature range of -40℃ to +85℃. The heat-resistant type features operability up to 105°C (257°F) for use in automotive infotainment, such as car navigation systems. By combining FPC/FFC with tabs, the new series offers a visual check to detect improper insertion. The connectors also make a “confirmation click” when locked or unlocked to improve operation efficiency. The 6815 Series corresponds to the FFC with impedance adjustment to enhanced transmission performance. Locking type Front lock D.W. Voltage AC 200V/min. *2 "V-by-One" is a registered trademark of THine Electronics, Inc.